Secretary of State Rex Tillerson refused to answer on Sunday when asked whether he called President Donald Trump a "moron," as first reported by NBC News. In an appearance on CNN's "State of the Union," Tillerson was asked point blank more than once whether he had insulted the president. The secretary said the line of questioning was part of "the games of Washington" but refused to deny that he had called Trump a "moron."
. @jaketapper: Did you call Trump a moron? "I'm not playing," Tillerson said. "These are the games of Washington. These are the destructive games of this town. They're not helpful to anyone." When asked again — with a reminder that a non-response might lead some to believe that he had, indeed, called the president a "moron" — Tillerson pushed back at CNN's interviewer, Jake Tapper. "I'm not dignifying the question with an answer, Jake," the secretary said, again refusing to say whether he had insulted the president. "And I'm a little surprised you want to spend so much time on it." The line of questioning then switched to focus on Tillerson's friend, Sen. Bob Corker, R-Tenn., chairman of the influential Foreign Relations Committee. After Trump attacked Corker on Twitter, the senator responded by calling the White House an "adult day care" and later told The Washington Post that the president had "publicly castrate[d]" Tillerson on the world stage. The secretary refused to directly answer the question and instead focused on Washington, D.C., which he said "actually enjoys the status quo." He then suggested that the president was making decisions "in his very unique style. And he is very unique." "He is certainly the most unique president we have ever seen in modern history," the former Exxon Mobil chief executive said. "I checked," he said. "I'm fully intact." And Tillerson insisted that the president wants him to pursue diplomatic solutions, declaring that Trump "is not seeking war" while discussing the White House's negotiating tactic toward North Korea. "He has made it clear to me to continue my diplomatic efforts, which we are," Tillerson said about Trump. "As I've told others, those diplomatic efforts will continue until the first bomb drops." The secretary later pushed back at accusations from Sen. Ben Cardin, D-Maryland, and Senate Majority Leader Mitch McConnell, R-Kentucky, that the Trump administration was dragging its feet on implementing new sanctions on Russia. As for the Iran nuclear deal that Trump had threatened to drop out of, Tillerson said that the Islamic republic had "remedied the violations, which brings them back into technical compliance." 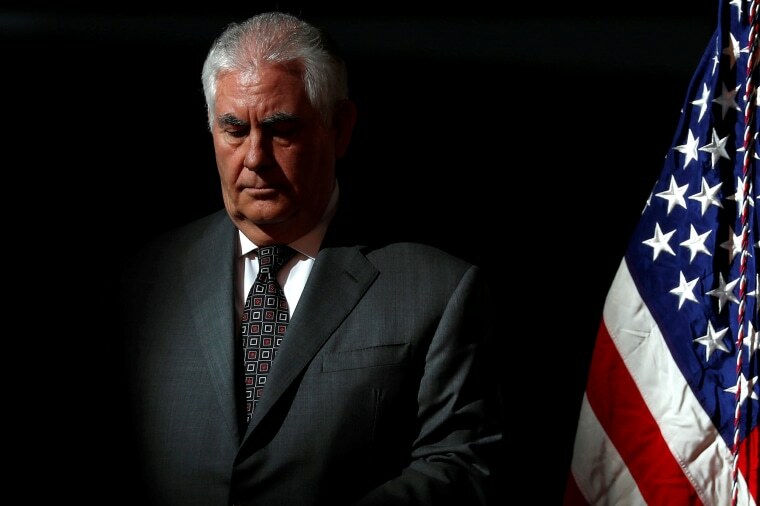 The United States would try to remain in the Iran nuclear deal, Tillerson said, though he would not reject the possibility of negotiating a new agreement. But Iranian Foreign Minister Mohammad Javad Zarif told CBS News' "Face the Nation" on Sunday that his country had grown increasingly wary of the White House, and added that it would soon become an international issue. Trump, he said, was gambling away the United States' ability to negotiate on the world stage now and in the future. "In order to bring United States on board on many of these international agreements, a lot of people make a lot of concessions," Zarif said, citing Trump's calls to withdraw from NAFTA, the Trans Pacific Partnership and the United Nations Educational, Scientific and Cultural Organization. "Now nobody is going to make any concessions to the United States," he added, "because they know that the next U.S. president will come back and say, 'It wasn't enough, we're not satisfied.'"